I have hunted sambar deer for over 40 years in the Gippsland mountains (and elsewhere). Mostly I did it because it was fun and an excuse for a day out in the bush which I love. I still prefer lamb, and having been a sheep farmer for just as long, I always had plenty on hand. These days I rarely shoot the deer I see, and I see many – more than half a dozen a day usually, and I hardly ever bother any more to hunt the mornings and evenings. If I did, I would see over a dozen a day I guess! NB: This post was written specifically as a request for a novice hunter who contacted me for advice. Tiny our oldest Jack Russell loves deer – she likes them cut up a little smaller though – mind you when I did so (for her) she promptly buried them, imagining (at 13) she would pass this way again. Dogs, it seems share our delusions… As it turns out she has been back for other visits, and is now (2017) 17! The Jack Russell is the pocket knife of the canine world – you should always have one about on or near your person! Tasty she says, and then snuggles up in my sleeping bag for a snooze. The dry food is rejected. First you need to go where there are lots of deer. Deer are lazy just like everyone else, and don’t want to travel too far for a feed, so there will be lots of them where the feed is best. The feed is best just where it is best for normal livestock: creek & river flats and improved pasture on private land – or what was once private land (eg the Wonnangatta National Park), the east side of North facing gullies, any clearing, particularly regrowth burnt areas & etc. The bush above clear paddocks always has bedded deer. Often there is a 4WD track in turn above it. Very handy. Deer love areas around water supply catchment dams for the same reason (eg Thomson, Upper Yarra, Moondarra, etc.) When the Thomson was low, you could literally see herds of them (50+) at dusk coming down to graze on the clear dam bottoms. The reek of them at the forest edge was unbelievable. Of course the forest areas surrounding are often too thick to hunt them (even if legal). They also love to colonise fresh burns and logging coups in larger numbers, and naturally their numbers are highest at the ‘peak’ of their ‘wave’ eg where they are moving into far East Gippsland. The regrowth burns on the Snowy should be great places to observe them this season – though it is not legal to hunt them in that area of the Alpine National Park (yet). You can check Google Earth for suitable spots in conjunction with Victopo maps and the GMA maps showing where you can legally hunt. Usually I prefer more gentle slopes now, but I used to delight in the steepest country because no-one else hunted it! Deer will almost invariably come by and make all sorts of noises within a chain of your camp (if you are alone/quiet) during the night. You could easily shoot them even in the light of the http://www.theultralighthiker.com/mini-super-torch-a-weeks-light-weighs-50-grams/ I wrote about the other day, as it is enough to light up their eyes. I never shoot at night. First, you don’t really know what you are shooting at, particularly if you miss. Second, if you take a shot and wound an animal, it will suffer horribly before you can possibly locate it (unlikely). I once found a spiker whose lower jaw had been shot clean off by spotlighters, and which had suffered dreadfully for many days. Its face was flyblown. It was moaning. If you want to drive around at night to observe deer, that is another matter. The Upper Thompson Rd rarely fails to provide encounters, as do many others. So, go where there are lots of deer. It is best if the bush is not too thick. You can also pick this up from Google Earth. Sometimes there are fire tracks not shown on current Victopo maps, (If you can get hold of the older maps, do), or old closed tracks which give access to less frequented country often on foot or by mountain or motorbike – or illegally. A canoe can also provide great access – and a way to get the meat out! See: http://www.theultralighthiker.com/you-take-the-high-road-and-ill-take-the-low/ I prefer not to run into other folks when hunting/hiking, so I usually hunt mid-week now, because I can, and never on holidays! It is good if you can see through the bush. You need to train yourself to look through it anyway. Your eyes/brain naturally want to focus on the nearest objects which means you are not seeing the deer through the trees; you are just seeing the trees. You can practice looking through the cracks in paling fences as you walk around the town streets, or looking through hedges as you drive along until you are used to focusing on the things that are on the other side of the screen of vegetation. You have to look into the distance. You have to put your eyes out of focus. It is a trick worth learning. Then too you will be better able to see the lie of the land, which is supremely important in finding your way and assessing a deer’s likely path. I can guarantee you that the critters which live in the bush always do this ie look through the bush – which is why they (almost) always see you first unless you are moving very slowly! Really thick bush is a pain anyway, and it will be harder to shoot a deer in it – unless you are hound hunting perhaps. When a deer honks at you but doesn’t run off is an excellent opportunity to test your ability to see through the bush. You can guarantee it is watching you, and will respond to your every movement, so its eyes (at least) must be visible to you. Practice finding those eyes; maybe an ear: they will be behind vegetation perhaps, but are in clear view. Deer will stand still for an hour! Believe me, but they are also past masters at sneaking off! Some folks have become ‘ambush predators’. They place camo cameras on trees near game trails, drinking spots and wallows, record the deer’s movements, then lie up in wait for them. Others have high powered scopes and ‘glass’ the opposite sides of valleys (up to a kilometre away) and shoot their deer long distance. I would find both these methods boring and unfair as well as despicable. I prefer to travel past lots of deer (and other things). There is always something new to see and learn in the bush (new things which are blue for example, in a satin bird’s bower). I prefer to be moving. The ‘Theory of Searches’ notwithstanding, (see Robert Sheckley’s ‘Mindswap’), you will see more deer (where there are lots of deer), if you walk past more deer. You will also learn where they bed, and especially where they go in really bad weather. Important knowledge for middle of the day hunting and when it is cold and rainy but you still want to be ‘up the bush’. Tip: Learn where there are ‘perched gullies’. Mind you, sambar don’t usually make a lot of noise. If they are moving along normally, you are unlikely to hear them, save for the very occasional snapped twig or chink of stone, particularly when they are crossing a stream. Sometimes the clack of an antler against wood. Rarely, you will hear them wallowing, thrashing. Very rarely fighting. Or the preludes to fighting: howls very like an old hound. Sometime you will be challenged by a stag with such a call. Do not think it is a hound. A lost hound seldom howls. You can howl and they will howl back. You can spend an entertaining hour at this play. They have their warning honk, not unlike a car horn, and there are many small sounds passed between hinds and fawns which you will only hear when they are at play coming down to graze in the early evening – and if you are very close. Being deaf as I am is not so much of a disadvantage in sambar hunting. Learn to ‘read’ deer sign: droppings, browse, rubs, thrashing, scrapes, preaching trees, combat zones, wallows, towel trees, drinking spots, tracks, paths, bedding spots…You need to learn not only how fresh it is but what it tells you about the deer’s life. Following deer tracks can teach you much, though you are not specially likely to shoot a deer whose tracks you are following (unless it is very deep asleep (sometimes) or has little experience (eg of hunters). Concentrating on following the tracks will almost certainly mean you miss seeing the deer which made them (Keep looking through the bush), but you will learn much about its habits, how fast it is traveling, how big it is, (I followed a stag – my daughter saw it – on the Ben Cruachan Creek years ago whose stride was much longer than mine), how it travels the terrain, where it beds, where its nursery areas are, what it is doing (browsing, mating, fighting…) This will allow you to later predict where particular (types) of deer are likely to be. During the day you are more likely to get a shot at them by dropping in from the side or above than from below. Learn to walk quietly but do not stress too much: they are used to things moving about in the bush – and being able to run away from them. Wallows are often found on flats about a chain inside and upstream river bends. Antlers can frequently be ‘fished’ from them. They mostly smell of stag. Fix the scent in your mind, and pay attention when you next smell it. Scent (that humans can smell) doesn’t carry far – less than 100 metres. Smell that? There is a stag in sight, maybe. Unfortunately they do leave their smell on other things. Never carry a loaded gun. The breach should always be empty. Forget so-called ‘safety catches’. More people have been shot because of them than triggers! I always use a lever action rifle because I can load it as I swing it to my shoulder. You are much more likely to shoot a running deer than a standing one. I always use iron sights because most shots are close and because they remain accurate just about whatever happens to your gun, and it is easy to see the deer over them. You are likely to drop your gun on rocks some time. Everyone falls over. A dropped loaded gun can easily go off! Make sure it IS a deer before you shoot. Early days everything looks like a deer (stumps, anthills, friends…) A missed deer can be shot another time; a dead friend missed a long time! A lever action also allows a quick follow-up shot should it be necessary. Theoretically, it should not – but I have put nine .30-06 rounds through the chest of a sambar stag at close range only to have it still standing there looking at me. I was out of ammo by then, so decided to wrestle it to the ground and cut its throat. I am here: it is possible to do this – but don’t! This stag (in rut) had no heart or lungs left yet he was still alive and standing – and fought for his life to the end! How I love deer! These days I use a .308 because it is lighter but will still make a deer just as satisfactorily dead as say, a much heavier (reloaded) .45-70, which I also own. My current gun is a take-down. This is handy when you don’t want to draw attention to yourself as a hunter, and when you need to put it in your pack because you are tired and want to use your hiking poles (I am old! ), or you want to put it in a dry-bag because you are canoeing: Lots of good deer country can be accessed by canoe. You can take lots of supplies, stay quite a while in luxury – and it is easy to get the meat out! Oh, and there are fish, which I prefer to eat. I never wear camo. I can pretty much tell that someone has been (or is at) ‘my’ hunting patch wearing camo from the behavior of the deer. People wearing camo really spook the deer. They will take days to return to their normal habits. This has nothing to do with the camo hunters shooting deer – they seldom do. Other deer do not run away because you have just shot a deer. You can shoot a deer here, then walk 300 metres and shoot another one. I surmise it is the spookiness to the deer of seeing the forest walking. Anyway, they seem always to make themselves a lot scarcer than if you are wearing ordinary clothes so that the deer can figure out what you are, ie some kind of animal like them. Deer will never see you when you are standing still. You can stand there all day; they will pass within yards of you – just spook when they whiff you! Most other wild animals are the same. It is laughably easy to creep up on a wallaby and catch it by the tail, for example. Just be still and bent over when they look at you. Nowadays (it is legal) I always take (at least one of) my Jack Russells. They are better company than most people; (‘No company is better than bad company’ an old friend says). They are smart as a whip; they eat little and give much in return. They are easy to carry across rivers on your backpack. They require a very small sleeping bag and mat. They know long before you do that a deer is: just there. Deer are not inclined to run from them, but are fascinated by them – which means they are ignoring you! They enjoy you shooting a whole deer just for them! Once you have done it a few times, you will easily be able to do it a few more. Forget about quietly sitting watching family groups of deer in the late afternoon with them around though. They will give the game away so that the deer behave differently. 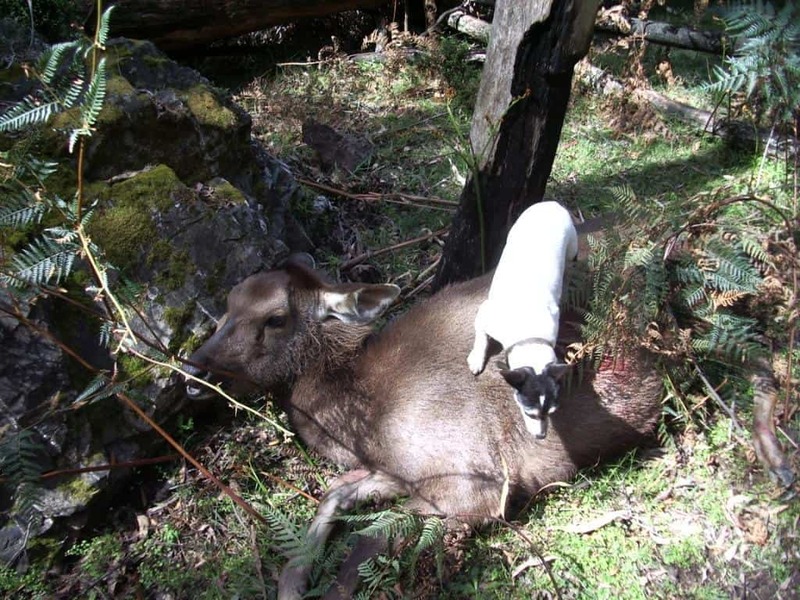 Deer will usually bail instantly for a Jack Russell when they would run from any other dog. Some dogs (the one above for example) snore however! Be warned. I am very pleased if my efforts are appreciated. Feel free to make (positive) comments or ask questions on the link provided here or on the Ultralight Hiker’s Facebook page. I will try to get back to you ASAP! I would also appreciate any other reader input such as gear tips, reviews, anecdotes, adventures, etc that I might publish. First Published 15 June 2015. Thanks so much. I grew up shooting foxes, pigs, rabbits in the 70s and 80s and now my 14yo son is prepared to start hunting. I am guided by him, he has no desire for trophy, only meat and spending time out bush together…and grandad is fizzing at the bung in anticpation of a shoot with his son and grand son. Thanks, i’ll be following your blog from now on. Glad you enjoyed it, Pete. Good luck to you both! I do enjoy those saltwater fish too – but we not only have trout (much nicer from clean mountain rivers), but also blackfish and freshwater crays. However, ‘May we all eat lamb in Paradise’ as the hero of ‘The Wind & the Lion’ declaims! What a fantastic article! Very well written.